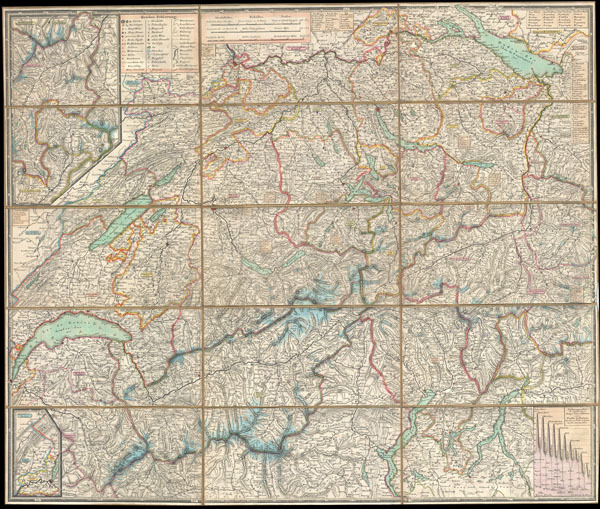 This is an extremely detailed and attractive 1834 folding pocket map of Switzerland drawn by the Zurich cartographer and lithographer Heinrich Keller. Covers the mountainous country from Lake Geneva to Lake Constance. Details numerous river ways, likes, cities, roadways, forts, castles, and monasteries. A stunning and rare example of 19th century Swiss cartography. Heinrich Keller (October 11, 1776 - September 18, 1862) was a Zurich based etcher, lithographer, cartographer and illustrator. Keller's father was a baker and in all likelihood Keller would have continued in the family business had not terrible fall down several flights of stairs left him with a complicated femur fracture. During the next several years, Keller was confined to crutches. Limited in his movement, the young Keller instead turned his attention to maps and sketching. Discovering himself to be a talented artist, he devoted himself to cartography, landscapes, physiognomies, and views. At 19, Keller took work as a colorist and art tutor with the well known Zurich print dealer Johann Heinrich Fussli. It was during his time with Fussli that Keller began to develop and audience for his travel guides, views and maps. Around 1817 Keller split with Fussli and set up his own small publishing firm in his Zurich home. He is known for an attractive c. 1827 map of Zurich and a supremely detailed 1834 wall map of Switzerland. Keller's panoramic views also have a considerable following. Very good. Dissected and mounted onto linen in 15 panels. Cartographer's stamp in lower right panel.